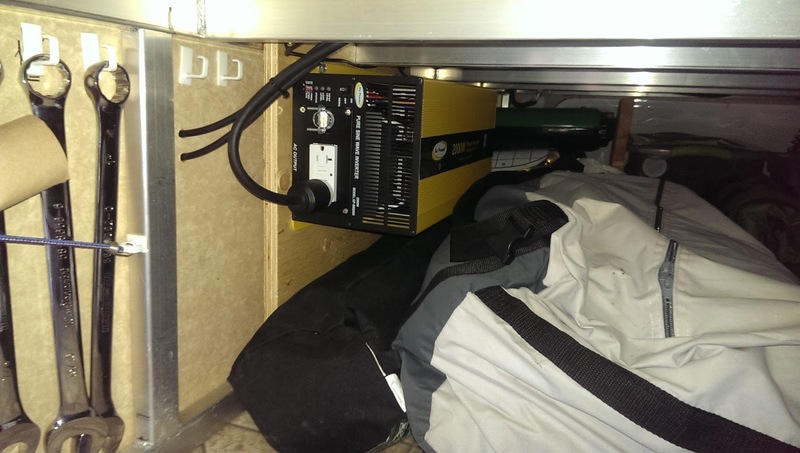 Boondocking or Camping Without Services. Enjoying dinner with friends while boondocking on Coyote Beach, Baja Mexico. 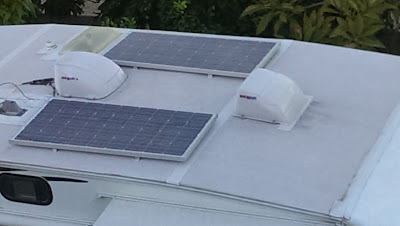 On our fifth wheel we had a solar system installed. 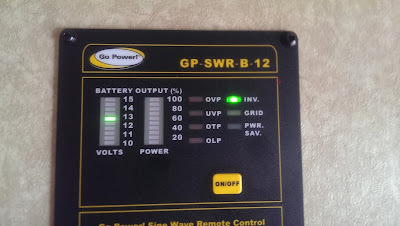 The system we have is by GoPower and is called Solar Elite. We had it professionally installed. Two 160 watt panels for a total of 320 watt. 50 ft of MC4 output cable and all mounting hardware. Inverter installed on the wall in the pass-through compartment. 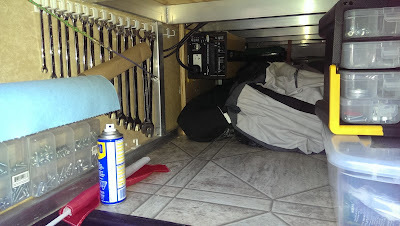 Remote in the trailer to turn the inverter on. 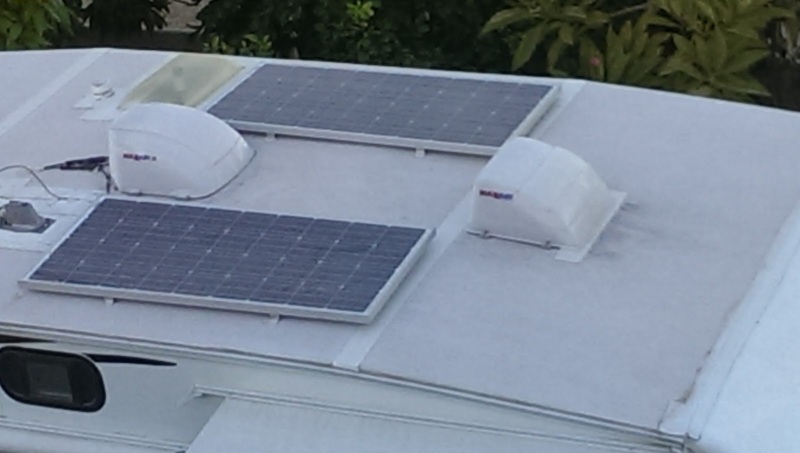 Two solar panels on the roof of our trailer. Nice to have when boondocking. 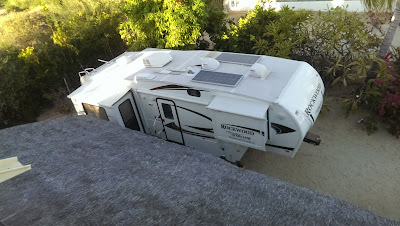 Our trailer from above showing the location of the solar panels on the roof. We also installed two new 6 volt deep cycle flooded batteries. 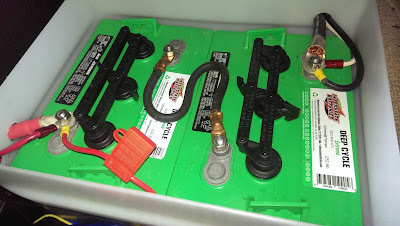 This year we have added another set of batteries and now have four 6 volt batteries. This will be sufficient for most campers. If you have an RV that is older then 2015/2016 (like we do) you should definitely change all the lights to LED lights, this will make a hugh difference. Go through your RV and see how many you need and order them on Amazon or where every you prefer to shop. You will be surprised at how many lights there are in your unit. Having some kind of solar system is pretty well a must if you plan to do a lot of boondocking. If you don't, you pretty well have to run your generator every day and it might not be appreciated that much by others if it goes on for longer periods. With our system we run our Nespresso coffee maker, hair dryer, TV, computers and just about anything. It is really nice to just turn one switch and there is power in every outlet. We often camp on Coyote Beach ( Baja Mexico). At the beach there are two local fellows that will sell you water, but otherwise there are no services. The "water man" provide you with a 45 gal plastic barrel and comes and fills water when you need it. The cost is about US $10.00 per fill. You then have to have some way of pumping the water into your RV if you use a RV. A 12 volt pump will do that just nicely. We added a 1/4 of a cup of bleach to each tank we filled up. We do not drink this water, but use it for all cooking. If you don't have water readily available you have to have some other way of getting water to your RV. This can be as simple as a bucket and carry water from a creek. What else do you need? You will need a blue boy or grey boy. This is a little wagon to transport your waste water away. We have a SmartTote LX 4-Wheel waste tank. Ours is the 27 gallon one. If you are considering the 35 gallon one, remember even the 27 gallon is very heavy (225 lbs) when it is full and can be tough slugging in sand and soft ground. Better to make two trips or empty more often. On Coyote Beach you dump the black water into the outhouses and rinse with the grey water. Many people will dig a pit by/under the RV for the grey water and keep it covered with palm leaves. Before you discard wastewater of any kind, make sure to know what the rules are in that area and do it responsibly. When you boondock you learn quickly to conserve water and power. There are many ways of doing this. Use a small plastic container for doing dishes. Use a solar shower bag for rinsing off when you come out of the water or otherwise having a shower. Take sponge baths instead of showers and I'm sure you can think of a few.